Our convention rate is $169 for the convention nights, plus three nights before and after the convention (subject to availability) so you can extend your stay in San Diego. Amenities for LCC registrants include free wireless Internet in guest rooms and meeting rooms and $15 self-parking (reduced from $25). Registrants will receive our hotel reservation code when the hotel opens our block in May 2019. The LCC discount code expires February 17, 2020. Questions about hotel registration? Email the Registrar. Just minutes away from the San Diego International Airport and within easy reach of all that San Diego has to offer, Mission Valley and Old Town are a great place to call home base. 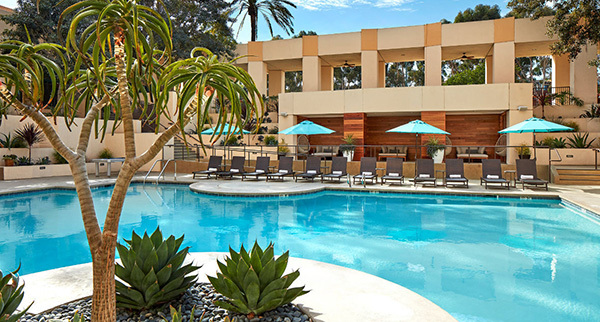 Conveniently located in the center of San Diego county, the area is within a 15 minute drive of the San Diego Zoo, SeaWorld San Diego, and Downtown Gaslamp District, and offers a wealth of affordable accommodations, family friendly dining options, and great shopping at both the Fashion Valley and Mission Valley malls. Quaint boutiques, mouth-watering restaurants, colorful art galleries and festive theatres also populate Old Town, making it a not-to-be-missed stop. Mexican cuisine is the specialty in Old Town. Here you’ll find authentic delectable fare at any of the many cantinas. Just follow the aroma of freshly made tortillas and take a seat outside on the patio. Enjoy the sounds of local mariachi, or watch traditional folkloric dancers as you sip on the best margaritas in town. Here you’ll also find the main boarding location for the Old Town Trolley Tours, which offers an excellent sightseeing tour of San Diego with on-and-off privileges. The Old Town Transit Center, located adjacent to Old Town San Diego State Historic Park, services passenger trains operating on Amtrak’s Pacific Surfliner and the San Diego Coaster with a variety of stops Downtown, including the Convention Center and Petco Park. Free parking is offered in the Transit Center lot.